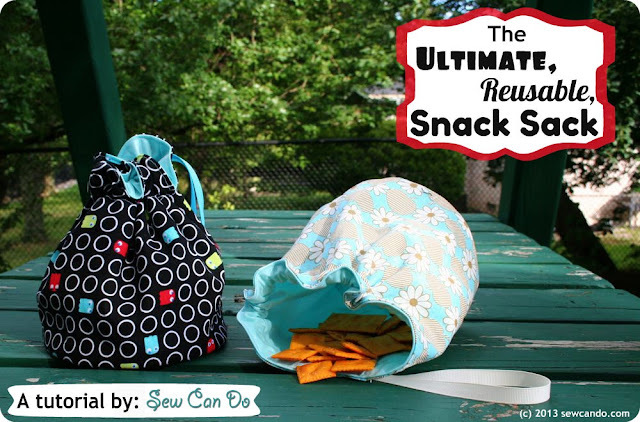 Sew Can Do shares a tutorial for making reusable snack sacks. I especially love that one of them has pac-man ghosts on it. Best. Idea. Ever. Crafty Journal turned a milk jug into a lego scoop. Go pin this! Life Love Larson painted an outdoor rug. Book lovers avert your eyes! Naptime DIY made a secret box by gluing book spines to the side of it. I love this classy dresser makeover from the talented Nalle’s House. Liz Marie Blog made a pretty wood wire picture display. And I got to meet her last week. Woot! 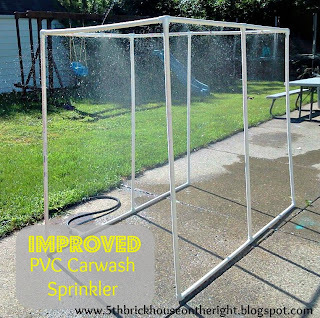 Most fun mom award goes to the 5th Brick House on the Right for her car wash sprinkler for kids. 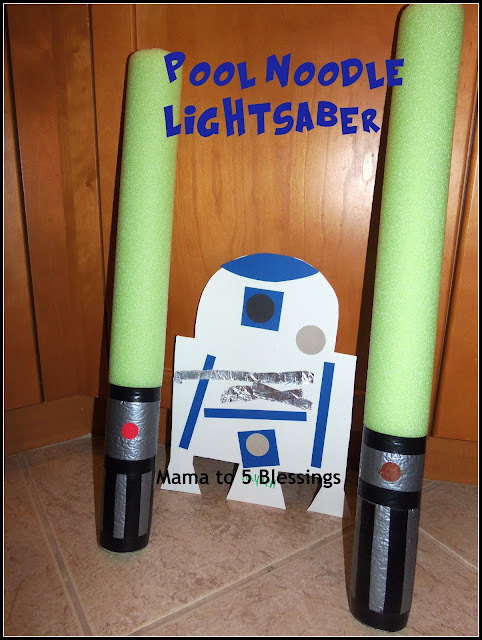 My son would flip out for these pool noodle light sabers from Mama to 4 Blessings. My grandma taught me how to make yo-yos when I was a little girl so whenever I see then I think of her and smile. 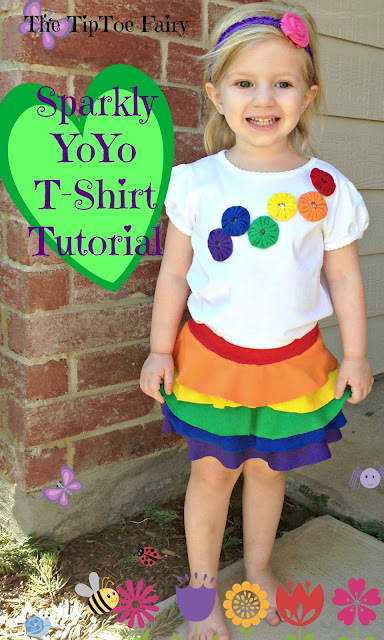 I love this rainbow yo-yo shirt from The Tiptoe Fairy. 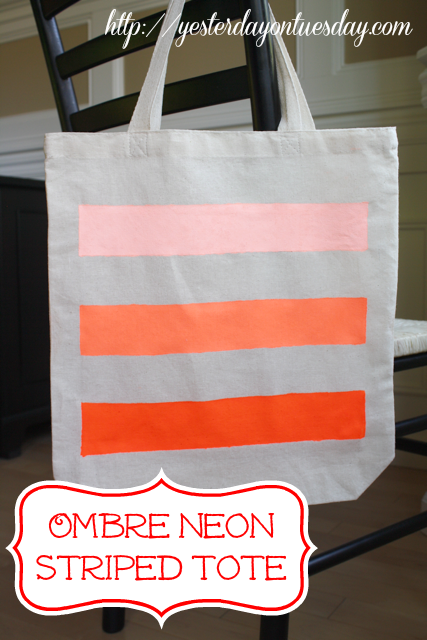 Yesterday on Tuesday turned a basic bag into a chic tote with just a little paint. 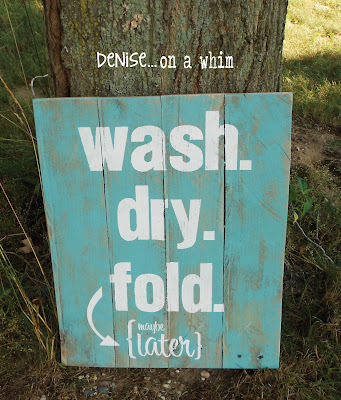 Denise on a Whim made some art for her laundry room that is just so fun and cheeky. Love it. « Goodbye green. Another room gets painted. Thanks so much for the party and for including my boys’ dresser in your features. Have a great day! Thanks for taking the time to host the party each week. I enjoy seeing all the projects. I love the art display. Thanks for hosting another great party! Thanks for the par-tay! I love the box tricked out with book spines…so clever! I am always amazed at what people come up with! And I totally understand ‘neutralizing’ your new space, you’ll have all the time in the world to put your own fun, creative stamp on it! Enjoy the rest of your week! Thank you so much for hosting, Allison! Your daughter’s room looks great with the new paint! (But you’re really going to miss that green, right? 😉 Hope you’re having a wonderful week! Love joining in with Hookin UP with HoH. Thanks for hosting. Have a great week. Thanks for hosting another great party! And thank you so much for featuring my Milk Jug Toy Scoop! Have a lovely day! Great party as usual! Thanks for hosting! thank you for the feature! 🙂 Thank you for hosting this great linky every week! Thanks for the great party, Allison!! Thanks so much for hosting, Allison! Hope you’re enjoying what’s left of summer. It’s flown by, hasn’t it? Have a great day! Thanks for hosting again sweet pea! Thank you so much for hosting! Enjoy the rest of the week! Thanks so much for hosting another terrific link party Allison! So fun! This is the first time I’ve included my projects on someone else’s blog. I don’t DIY often! Maybe I’ll have to start picking up more projects! Great to see what everyone else is up to! Thank you for a great party Allison! What great features! I am loving the books but I know it is hard for book lovers lol, maybe ones that are falling apart. It is like they are reborn lol! Thanks for another great party Allison!